WINNIPEG, Canada -- A waitress who said she works two jobs "just to get by" was brought to tears by a generous diner last week. 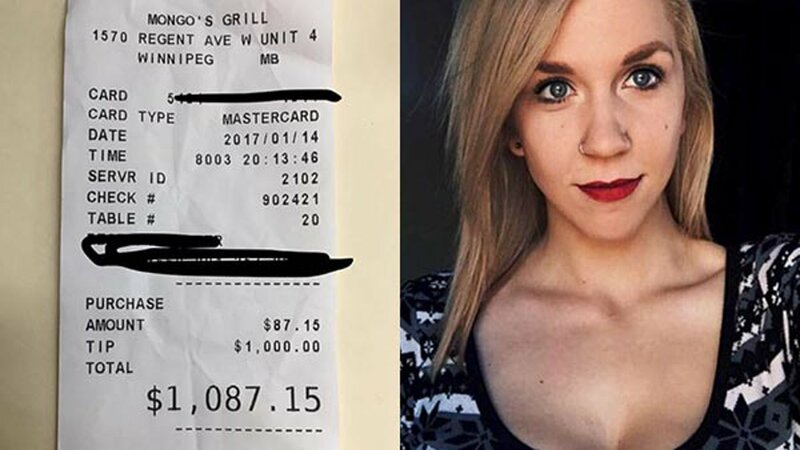 Jennifer Peitsch, 20, told ABC News she received a $1,000 tip on a $87.15 bill last Saturday while working at Mongo's Grill in Winnipeg, Manitoba. Peitsch said she was stressed out the night she received the large gratuity because it was an unusually busy night and all the orders were taking longer than usual. "This woman told me she used to be a waitress and she understood how I was feeling," Peitsch said. "I thought it was a mistake, but she assured me it was the right amount, and I just started crying and thanking her so much." While Peitsch didn't get the woman's name, a Facebook post she wrote about the incident helped lead her to the mystery diner: a woman named Lisa Julia Holgate. "She asked me why I did this, and I said I was a good person, and I figured that she was a good person and she's working hard and she deserves it," Holgate told CBC News. "I just said, 'Pay it forward.'" Peitsch said she's already used the $1,000 to pay off a credit card debt and excited to start saving for college.